View from my seat at a Kansas City Royals game. I did have a nice view of the field too but this area of the stadium really caught my eye. The Royals did beat the Detroit Tigers 6 to 5 on this particular night. Fun time in a beautiful stadium! Part of the restoration of Forest Park included stone balustrades, overlooks and bridges over the Grand Basin. I have painted each them several times in oils and watercolors. 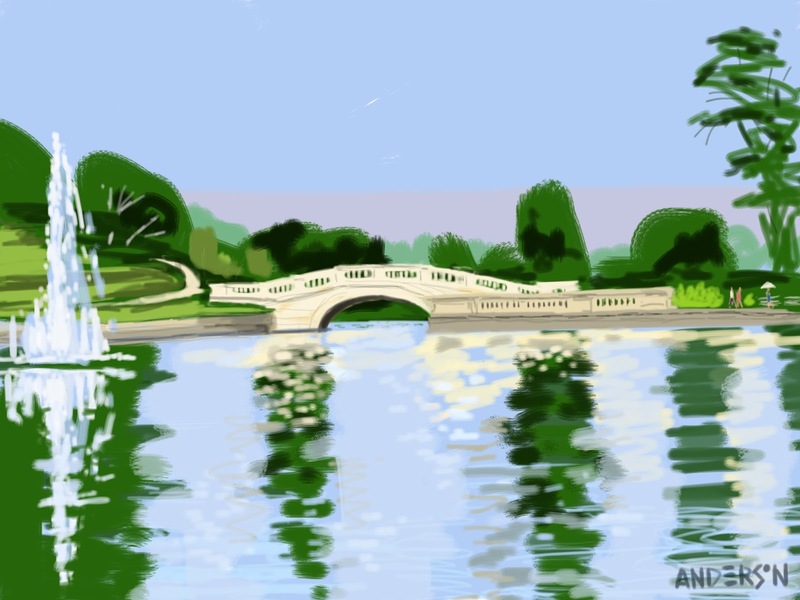 This sketch was made with Brushes for iPad using a Jot Mini stylus which is very precise allowing for small detail. Like most sketchers I obsess over my pens and brushes. Same feelings go for the stylus! Grand Basin Bridge, Forest Park, St. Louis, 07/14/2013. Michael Anderson, sketch with Brushes for iPad. A group of us met on Saturday at Kansas City's Union Station, meeting under the large clock where people have been meeting for decades. Pirates were attempting a takeover, a few of them escaping from the traveling National Geographic exhibit. The main concourse was very busy, with people heading in all directions and a local art exhibit on display. After a while, I escaped to this old waiting room -- very serene with the lovely antique lamps, sunny windows, and old-time wooden benches. 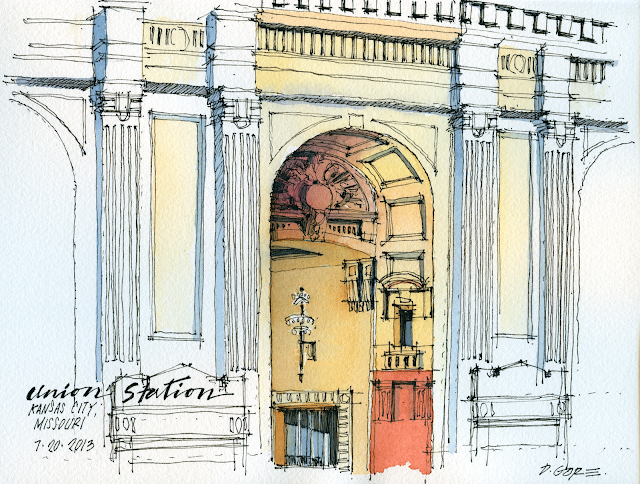 I planned on sketching the benches next, but we had reservations at the Harvey House, located right in the station. On Monday I was up at the Peggy Notebaret Nature Museum in Chicago. It was a delightful day. 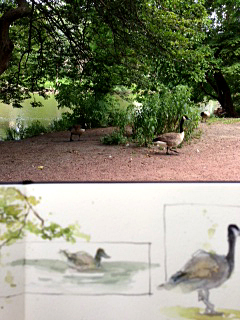 Shade, a cool breeze, geese and a duck for entertainment. The city, despite its many problems, has done a wonderful job reclaiming some of the wetlands and replanting native flora. It's great to see so many of the native animals return too. There were several beautiful birds, whose names I don't know, around the pond outside the museum. Their camouflage made them difficult to see let alone draw! What can I say? I'm a sketcher not a photographer! 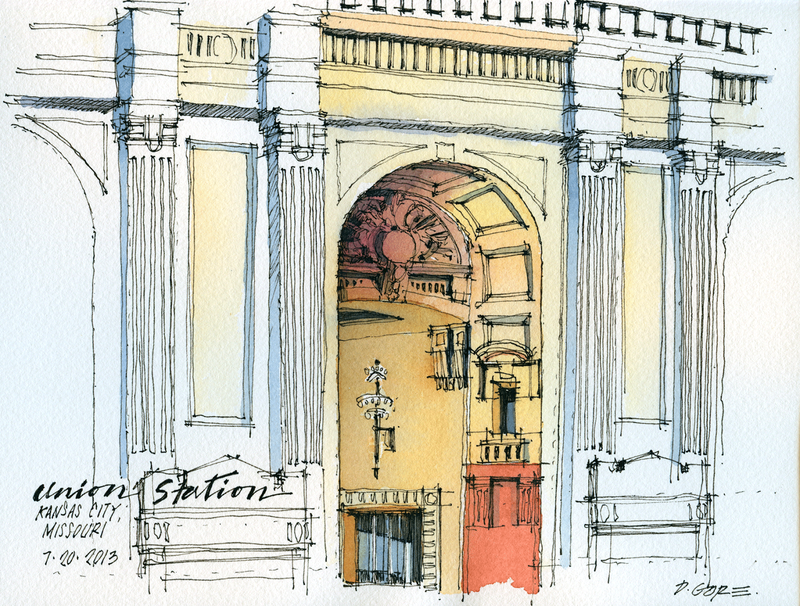 Had the opportunity to do this drawing as part of the July sketchcrawl at Union Station. 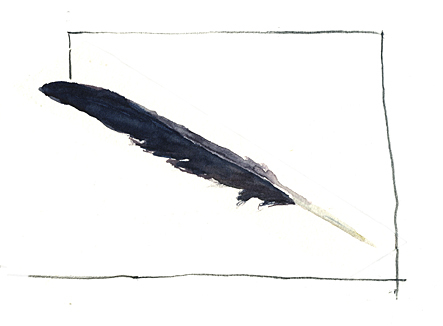 I did the drawing on-site but did add the color later at home. My time was limited Saturday afternoon but was glad to have the chance to at least get this drawing done. Thanks as always Kate for arranging the outings! Bill drove down to Houston to drive me home (I flew there the first part of June). Because his time away from work was limited, we asked all our kids to drive to Brenham to meet us for lunch on Saturday, Brenham being sort of centrally located between everyone's homes. Had a blast eating at Ernie's, a downtown restaurant I found doing a Google search. They gave us a private room and we could let the little kids run and play. After eating, our son-in-law took us driving, looking at homes for sale in the area. Our top three favorites, located near a lake, are sketched above -- two of them are log-style cabins! We would like to find a smaller home with a large detached garage or outbuilding to turn into a woodshop for Bill when he retires later this year -- two of these had such buildings already on site. Grand Basin, Forest Park, 07/07/2013. Sketched with Brushes3 for iPad. 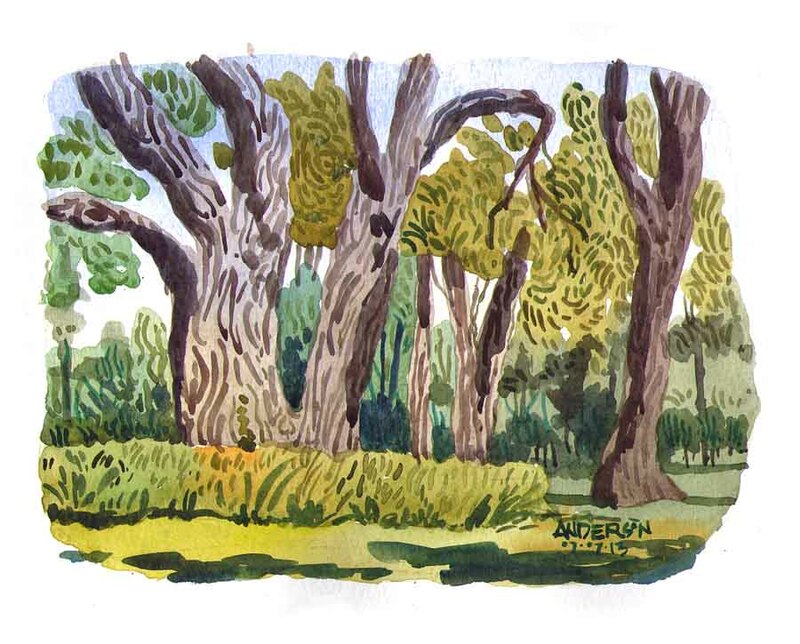 ...a favorite place to sketch on a summer morning before the heat and glare takeover. 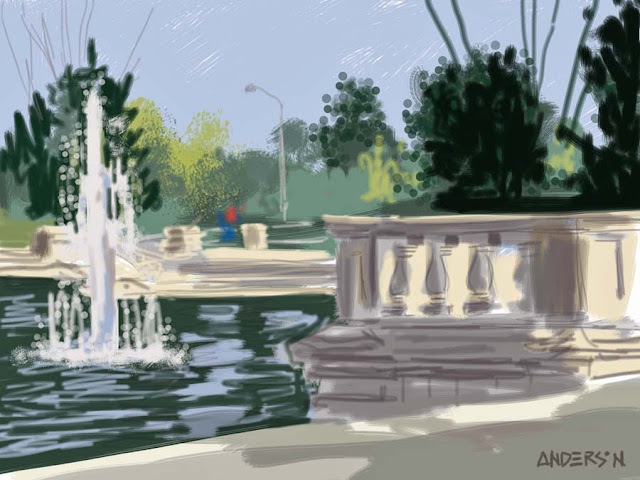 After finishing the digital sketch I joined up with fellow Missouri Plein Air Painters Assoc members and sketched some trees in Forest Park, truly an urban oasis. Urban Oasis, Forest Park, St. Louis, 07/07/2013, watercolor on Canson 140lb cold pressed. 9" x 7". 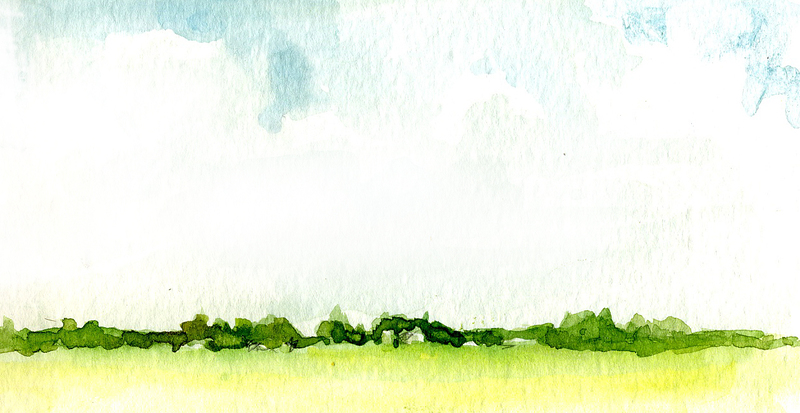 On a recent road trip to Ohio I was reminded of when I first moved to the midwest over twenty-five years ago. I thought "the sky is so big and the trees are so small!" I still think that and I still think it's beautiful! Captain George is an old tug that's been sitting idle for a number of years. It sits, tied with lines that have seen better days, next door to the marina where I keep my boat. The old tug was originally from Frankfort, Michigan and at one point in its life was steam powered. These days the tug sits...not sure it can even be powered up. It's an interesting accent to the shore line and is certainly fun to sketch.